Dollies for rent. We have Matthews dolly, Key West dolly, Ladder dolly, Fisher 11 dolly, Skateboard dolly, Spider dolly, Doorway dolly, tripod dollies, dolly track, and more. The Dana Dolly is an updated version of a design used in the film industry for decades. After making similar dollies for years for friends, Mike Hall decided to simplify the design, and modify the components and composition to make the entire system easier to use and more affordable. The dolly is the product of hundreds of shoots and modifications since the early 1980s, when the cameras were much heavier. We tried a number of different wheels and bearings, and composites, steel, and aluminum before coming up with the combination that we believe is all three: Good, Fast, and Cheap. The Dana Dolly V2.0 is now made of 6061 Aluminum finished Black to cut down on reflectivity. The bottom of the plate is milled out to cut down on overall weight, while not compromising strength. The triangle trucks are welded aluminum, finished black. The wheels are custom made soft, then turned down to be round within 1/1000 of an inch (thinner than a human hair) to eliminate the "bounce" that normal skateboard wheels give. The turning process also helps keep down the squeak that some dollies experience. We have our bearings specially made to compliment the wheels. The dolly wheels are designed soft to give a very smooth, squeak free move with any size camera, and can be used for today's SLR's and full-sized 35mm cameras with no problem. Heavier cameras may require the use of a middle support for longer track moves, and the wheels are not a good fit for any use that would put over 100lbs on 16 wheels. The dolly now has a 1/4-20 and 3/8-16 threaded hole on each side for accessories such as LED lights or monitors, as well as a 3/8" through - hole in the middle of each side. The plate measures approximately 14" long and 10" wide, and the trucks are just shy of 12" on center. The plate has a standard Mitchell Mount milled into the center of the dolly plate, with an elongated slot to accompany non-standard adapters. We make three standard sizes of ball-mount adapters: 75mm, 100mm, and 150mm. The Track Ends are designed to go into any "Junior" or 1 1/8" receiver. They do not work with "Baby" stands, or "C" stand spuds. After a couple of years of making track ends that fit these stands, we determined that baby stands are just too unstable to handle the dolly setup. Most customers use a "Baby Combo" stand to support the track. Although just two turn knobs are required each side to secure the track, four holes are supplied (two serving as backups). The original dollies were made of Wood, then Aluminum, and then we had a composite Dana Dolly. The composite proved too expensive for our purpose, so once again the 2010 dolly is made from Aluminum. Discover the power of the SKATER® Mini, the flattest camera tracking device ever with a height of only 2.0 inch / 51,4 mm! With almost no prep time, you can do linear tracks in any direction as well as all sorts of curved and circular moves. Avoid complex rigging or even motion control and see how fast the SKATER® Mini is to work with. Use the SKATER Levelling Support to hold and easily level a custom-made tracking board for your SKATER Camera Dolly and work at any camera height. The 28mm pin fits directly into standard lighting equipment. An adjusted levelled height can be fixed with a blocking nut. Each Levelling Support comes with 2 Guidance Rings to be mounted on the bottom side of your tracking board to keep the board into position. The RED Dolly is Matthews' newest and perhaps most versatile piece of equipment. Outfitted with Matthews Mini Bazooka, the RED Dolly performs moves that other dollies just can't match. From tight 360 degree repeatable full circles to "crabbing" and the quick dolly reverse shot... remove the seat and there is a SteadyCam standing platform equipped with side receivers for lights, grip equipment, Bungee Cam, Rail rigs and more. Also works with all Matthews car mount accessories. The new Round-d-Round Doorway Dolly from Matthews is the next generation in Doorway Dolly development. Based on the industry-proven designed and engineered Matthews Doorway Dolly, the new Round-d-Round model offers all-wheel steering which allows for greater turning flexibility and will turn in a tight 6 foot (2 meter) circle. The camera operator seat will mount in six different fixed locations. Steering from both ends of the dolly will allow unlimited camera positioning as the dolly rolls on track with either Hot Buttons or the Matthews Centipede or on the ground with the standard pneumatic rubber tiers. Load capacity is over 1100 pounds (500Kg) and the platform is carpeted for a nonslip, low-maintenance surface. Lightweight and compact, the Model 11 Dolly shares the same controls and characteristics of the Model 10 Dolly and has a complete line of its own accessories. It operates effortlessly on Square or Round Track, making the Model 11 and Model 10 an excellent two dolly combination. Four wheel dolly with hydraulic boom. THIS DOLLY DOES NOT REQUIRE TUB WHEELS. IT RUNS DIRECTLY ON A TRACK. The Losmandy Spider Camera Dolly is the most portable professional camera dolly on the market. Combined with a piece of FlexTrak, the 4-Leg Spider is a fully rideable camera dolly with adjustable center column, a seat that pivots 360 degrees around the column, foot platforms, and pushbar. Both the 3-Leg and 4-Leg version can work on traditional steel track, or on track made of pvc pipe, or on our award winning FlexTrak--a flexible track made of a special rubber compound that not only rolls up into a bundle for easy transport, but also allows you to make straight or curved dolly moves with almost no set-up time. The rideable 4-Leg Dolly packs into three cases. The largest, which has a fold out handle and wheels, carries the base, the 4 wheels, the push bar assembly, and the foot platforms, and weighs 80 lbs. The Adjustable Column with its Top (either 100mm, 150mm, or Mitchell) goes into the second case which weighs 28 lbs. The Seat Assembly goes is in the third case and weighs 38 lbs. You can now have a rideable dolly system with 40 feet of flexible track and transport it in almost any vehicle. The Losmandy Spider Dolly is the most portable professional dolly on the market. Combined with a piece of FlexTrak, the simple 3-Leg Spider converts your tripod into an inexpensive, extremely portable, tracking dolly. Tripod is not included with this Dolly. This amazing seamless dolly track can be configured in straight runs that can suddenly curve in any radius or direction. The basic unit is 40', which will loop to make one 17' run. 2 pieces side by side will create a 40' run. Each section rolls up into a 2' diameter bundle and weighs 40 lbs. creating unprecedented portability for a track rigid enough to support an operator, yet flexible enough to curve into a 90 degree turn with a 2' radius. The key to FlexTrak's success lies in the unique capability of our Spider Dolly's track wheels, which are designed with double articulating arms that create the ability to negotiate sharp radius turns. It can also work with other dolly systems because the outer diameter of the FlexTrak is the same as that of standard steel track. Rail Cam has a variable speed stepping motor, 150mm ball with smaller adapters. Comes with 17 ft of straight rail, 1 45 degree and 1 90 degree. 4 tripod stands and connecting rail adapters. Can be mounted from ceilings, walls, tripods, etc... has an assortment of mounting and leveling hardware and upon request we can arrange an experienced grip to help you with the RailCam. NOTE: This is designed to make slight moves in the camera position. IT IS NOT A CAMERA DOLLY...it will not make a smooth and usable "on air" move. 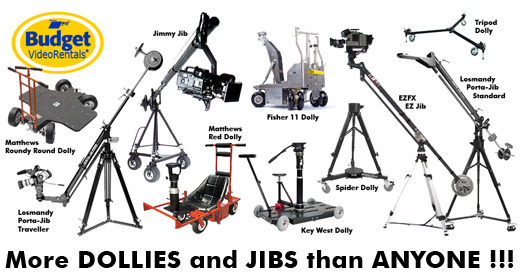 Please look at all the camera dollies we offer if that is what you want to do. Including 16 wheel track assembly, platform extensions. Plus extras. For Fisher, skateboard, or most other dollies when used with a "tub". Pair of Fisher fully articulated dolly tubs / skateboard sleds for use with straight AND CURVED dolly track. Easy to push, easy to pull, friction free turning on curved track. All 32 wheels maintain contact on both straight and curved round track. Pair of dolly tubs / skateboard sleds for use with STRAIGHT OR 45 DEGREE dolly track. This model of tubs does not work with 90 degree track. Pair of Matthews articulated dolly tubs / skateboard sleds for use with straight AND CURVED dolly track (45 or 90 degree).